Boroleum is a versatile analgesic ointment, formulated for effective relief of a wide variety of nasal and facial skin discomforts. When applied to the nostrils, Boroleum provides gentle, soothing relief of dry nasal passages and redness, itchiness and nasal soreness caused by cold and nasal allergy symptoms and nasal pain caused by cold, flu or runny nose. Its time-tested blend of ingredients gently softens and soothes, and moisturizes dry, cracked or raw facial skin and soothes chapped lips caused by harsh temperatures -- an ideal skin protectant while skiing, snowboarding, hiking, boating or other outdoor activities. The skin protectant has a light menthol-eucalyptol scent, and is gentle enough to use on facial skin of children as young as 2 years old. 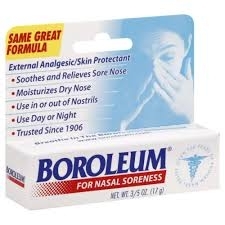 A small dab of Boroleum goes a long way in relieving discomfort caused by seasonal and health-related nasal soreness. Adults and children 2 years of age or older: apply to affected area not more than 3 to 4 times a daily. Children under 2 years of age: consult a physician. If condition worsens, or if symptoms persist for more than 7 days, or clear up and occur again, within a few days, discontinue use of this product and consult a physician.